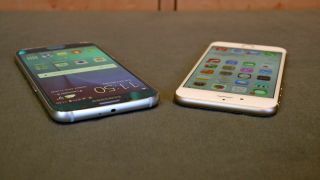 Earlier this week Samsung announced the anxiously-awaited Galaxy S6 and Galaxy S6 Edge. The 5.1-inch quad HD resolution (2,560 x 1,440) phone features a 16-megapixel camera, comes in different colors, and is likely to be a hit with consumers. More adventurous (and more financially secure) buyers will likely flock to the Galaxy S6 Edge and its bent edges. I won't give you a full rundown of the S6 and S6 Edge specs as my colleague Gareth Beavis has already done with his hands on reviews (links above), but I figured I would use this space to highlight the most relevant enterprise-friendly features and why they warrant your attention. The Galaxy S6 and Galaxy S6 Edge are the first smartphones to feature a 64-bit octacore processor that can crack 14 nanometers. The company's Exynos SoC chip enables the phone to perform significantly faster than comparable devices, such as the HTC One M9 and Nexus 9, which feature Snapdragon 810 and Nvidia Tegra K1 Denver processors, respectively. If you make IT purchasing decisions, you'll want to focus on build quality in addition to performance. After all, it doesn't make sense to build your enterprise fleet with powerful and speedy devices that crack and explode. The new Samsung phones combine a metal frame with a Gorilla Glass 4 exterior that wraps around the entire device. The fourth version of Corning's Glass is twice as tough as the previous version and can withstand three-foot (one-meter) drops 80% of the time. The glass should also be able to completely withstand the scratches and fades associated with typical day-to-day usage, so you should feel comfortable giving even your most butter-fingered employees an S6. No manager hates hearing that their employees weren't able to finish a task because their laptop or smartphone battery died. This is why battery life and battery performance should be a major factor when considering which devices to purchase. We haven't yet been able to determine how long the battery life of the S6 and S6 Edge will last, but given the 2550mAh performance, coupled with a high resolution screen sucking out power, battery life could be an issue. With that being said, you will love being able to charge the S6 and S6 Edge wirelessly. What you'll probably enjoy even more is the ability to quick-charge the device to 50% in only 30 minutes, which is in line with some of the fastest phones in the world. Also, if you've got to charge the S6 or S6 Edge in a hurry, you can plop the phone onto a charging surface for only 10 minutes and receive up to two hours of performance. Need to make a call as you drive from meeting to meeting but battery life is dangerously close to dead? Drop the phone onto a charging station for 10 minutes while you sip a latte and you should be good to go. Most enterprise device purchasers associate Samsung and its Knox application as the standard for mobility management and security. On the new devices, users will be able to access two different environments (one for business, one for play) with the tap of a desktop icon. App managers will be able to deploy, manage and remove applications from the back end without having to physically access each device. Additionally, the S6 and S6 Edge offer remote wipe, which self-destructs the phone's data in case of theft. Samsung has upgraded its fingerprint sensor to be more accurate and easier to use. Traditionally, the company incorporated slow and faulty sensors into its devices. The new TouchWiz process provides the device with a more comprehensive image of your thumb, which limits the misreads that had been common on previous devices. Although reports suggest the device doesn't unlock as quickly as Apple devices, it won't be classified as slow and clunky anymore. Hate it when someone at your meeting receives a call and the entire table vibrates? Or, God forbid, his/her ringer activates? With the Samsung Galaxy S6 Edge, you can set your phone down on its face and receive a silent, color-coded indication on the edge screen that tells you if someone is calling or texting. You can program your device with up to five contacts that are represented by a unique color. So, if your pregnant wife is trying to reach you while you're in a meeting with your boss about your job performance, you can see that you're being summoned without audibly disrupting the conversation. Although the S6 and S6 Edge will work for some enterprises and small businesses, they are not perfect devices. Some users will be disappointed to hear that the microSD slot has been removed. Also, because Samsung has locked in the S6's battery, you will no longer be able to swap in a charged battery on the go. As I mentioned, battery life is likely going to be an issue for both devices. The Edge model will also likely be quite expensive. And, more importantly, your staff might be predisposed to Apple devices. With that being said, the Samsung Galaxy S6 and S6 Edge offer a great deal of valuable features for enterprise and small business users.